My 19 year old granddaughter asked for a halter top. I found this pattern and thought it was adorable. 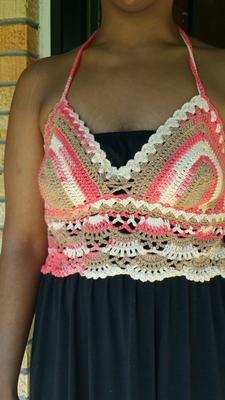 I was apprehensive though because I had never made a bra top before. I thought the pattern was well-written and the photo tutorial was a big help. All I can say is, just take it a step at a time. It's worth the effort. I enjoyed it so much, that I'm already beginning another. And oh, by the way. . .My very particular granddaughter just LOVES it! I am so glad you enjoyed this pattern so much. Thank you for sharing your project. I am happy that your grandaughter, particular as she is, loves it.